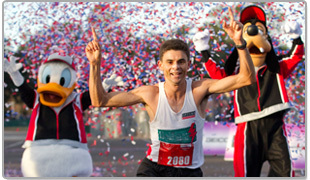 Cardmembers save $35 on the 2012 Walt Disney World Marathon or Half Marathon race entry fee or $70 on the Goofy Challenge race entry fee when you register early with your Disney Rewards Visa Card or Disney RewardsSM Debit Card. You’ll want to be here for a weekend of races that are as magical as they are memorable! Whether it’s the Marathon, Half Marathon or the Goofy Challenge, every mile is filled with Disney fun. Epcot again, for an exhilarating finish! With a race filled with this much Disney magic, you’d be Goofy to miss it!Â Don’t miss out on any of the funâ€”register now for the 2012 Walt Disney World Marathon Weekend! Cardmembers mustÂ register online by April 24, 2011 with yourÂ Disney Rewards Visa Card orÂ Disney Rewards Debit Card to receive maximum savings on the Disney Marathon and Half Marathon and Goofy Challenge race. Click here to register with yourÂ Disney Rewards Visa Card orÂ Disney Rewards Debit Card and qualify for your race savings. It’s so easy to create a little Disney magic with your photos. Save 25% on mugs, mouse pads or magnets from Disney’s PhotoPass Service, customized with your own photos! Use a Disney’s PhotoPass Photo from your visit to a Theme Park or upload your own. Choose from over 20 fun design choices and make yours even more personal by adding a special message. It’s a great gift for the Disney fans in your life! Keep your favorite moment at your fingertips with a high-quality photo mouse pad. Bring a little Disney magic to an average day at the office! Dress up your fridge with a fun Disney memory! Select from a wide variety of Disney Ear Hat designs to celebrate special occasions, your favorite Disney Character or the holiday season. To save 25% now on Disney’s PhotoPass mugs, mouse pads or magnets, use your Disney Rewards Visa Card or Disney RewardsSM Visa Debit Card at checkout and enter promotion code REWARDS.Â Offer valid through 5/15/2011.